Q: How did you come up with the idea for Balance of Fragile Things, and why did you want to tell this story? 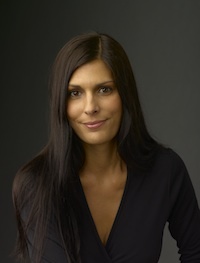 A: The book is a culmination of cultural narratives that consider the powerful connection I’d always felt to the land through my parents and their cultures. While studying literature at Binghamton and C.U., I found it difficult to get my hands on books that were considered both multiethnic and environmental. Postcolonial eco-critical ideas were just converging as a sort of late-to-the-party nuanced theory. I have always felt a strong connection to the environment and land, and I attribute that to my parents’ love for nature and the stories that my grandmother on my mom’s side imbued me with when I was a child. In order to reconcile this strange lack, I took it upon myself to craft this book. The family, the Singhs, represents the quintessential American family that rarely gets the center stage in a work of fiction. To me, they are simply an all-American hodgepodge of a family. They fight to assimilate while holding onto their history and personal cultures. Q: What were some of the sociological issues that you wanted to explore in this book? A: I feel that we today have the luxury to reflect upon the past with comfort and peace. We have a privileged position in history. Though there are many of us who are still marginalized, as Americans we already have a voice. Though we still have plenty of barriers to break down, we have the ability to speak and write about the things we need to change. We are gifted with so many freedoms we don’t have the ability to recognize because of our birthright. We need to take care of the freedom we have. We should be careful not to become complacent. Many of us were born with this kind of haunting feeling that we cannot take for granted what our ancestors fought so hard to achieve. They made it to America, but not without loss. Many of them encountered severe racism when they arrived. But still, they arrived. They escaped not unscathed because there, in the past, their relatives died. Their families died. They shed their blood all across the land, and yet here we are born. It is like being culturally haunted. Here we stand. We are protected. We have so much opportunity. Why would we waste one single day? This is the fire that drove me to write this book. In a way, I sought to memorialize the past and merge it with my present concerns regarding the environment. Shortsightedness is the biggest failure of our privileged position as Americans. With the ability to change in our hands, why would we choose to stop seeing the outcomes of so many of our actions? Rather than focusing on growing, we should be focusing on improving our systems, industries, lifestyles, quality food availability, etc. Why do we choose to be blind to the poisons we release into the ether and water? We are intelligent enough to know there will be consequences. Let knowledge be the first step. Then action. Q: What was your inspiration for the setting of Balance of Fragile Things? A: I began research for the book the spring of 2006, in Endicott, New York. I was just finishing my first year of study at Binghamton University (SUNY), and all seemed well. Until, that is, it started to rain. It rained for days, weeks, until the rivers breached and the town flooded. The roads and bridges washed out. Then the warnings came. Endicott residents: Do not use the water from your tap. Boil water, or use bottled purified water for cooking, eating, and showering. The National Guard came by and taped up the faucets. I fell ill, as did many others. I did some research and found that my apartment was strangely close to an old IBM facility, and that same facility had previously been a leather treatment plant, and so on and so forth into historical chemical contamination land. IBM stored VOCs (volatile organic compounds) in leaky drums under the town when it closed down the facility. These same VOCs, I later found out, had caused cancer and birth defects, and the town is now in a suit against IBM for their corporate carelessness. These same barrels were on the water line in Endicott. The VOCs were in the water supply during the flood. I was enraged. I relocated. Permanent Endicott residents were not so lucky. Their housing prices continue to drop. Illnesses abound. I felt it was important to set this novel in a place like Endicott during the flood because their stories rarely reach a wide audience. Q: What was your writing process like? A: I did a lot of research while simultaneously writing. I traveled to Northern India with my parents and grandmother in order to trace her path after the Partition. I needed to see where my father’s family was from. I also traveled with my mother to Riga, Latvia, a place she had never been. Her mother was Latvian, her father German, and she was born in post-war Germany. Even so, her mother, my Oma, was such an influential character of my childhood, and her tales of Latvian life always haunted me. The character of Oma made so much more sense after visiting Riga. I saw Oma’s face in so many other faces around us. I wrote nearly every day and, before this final version, I wrote three versions. The first was experimental. The second was a more traditional tale. The third was a combination of the two. Because there are six different points of view, it was more complicated than I had originally imagined. Though the characters were and still are so clear in my mind, and their voices and internal narratives are as well, the thing I struggled with most was point of view. I write in my home office. When I am writing, the office becomes an art exhibit for the book on which I am working. I collect images and art objects that inspire settings and tack them to the walls. I take photographs from my butterfly watching, and other tchotchkes that draw me sensually into the world. For this book I made a sound track that consisted mostly of opera, Madame Butterfly and other very dramatic pieces. Every morning, I would take my coffee with me into the office, sit down, light a candle, press play on my iPod, and bam!, I was right there where I left off. I also heed the advice of Hemingway in that I never finish a full sentence when I am ready to stop writing. I leave it half done so that my brain has to wrap itself around finishing that sentence the next morning and returns immediately to the world of words. Q: What was your research process like? A: I spent time researching and interviewing family members about their experiences during the Partition, along with academic research about the aftereffects of the Partition. I traveled extensively in the Punjab up to the border of Pakistan, but we didn’t cross, as it wasn’t safe at the time. I watched the changing of the guards. There were massive Pakistani and Indian men, all of whom were probably Punjabi milk and corn fed. They towered, six foot six or more, over the rest of us. The two fences of razor wire that stretched across the curves of the land in either direction met here in two stadium seating areas that sat hundreds and were full of hot people in the sun. We sat on the Punjabi side and stared at the Pakistanis through the gaps between the iron fences. They stared back at us. It was totally understood, this literal divide, something expected, even enjoyed by the spectators. The massive gates that separated the two countries were, of course, locked, and I couldn’t help but think that we were actually placing ourselves in a dramatization of the Partition. Here we were, agreeing to sit on our representative side of the gate. Staring at each other. Baking in the Punjabi sun. Jeering at each other. Screams of “Hindustan Zindibad!” and “Allah O Akbar!” filled the terracotta dusty air. The tension was palatable. I finally turned to my family with a sort of claustrophobic gaze and told them I couldn’t breathe. The sounds were overwhelming, a sort of passionate aversion boiled like a betrayed sibling that you love and hate. What shocked me most was the feeling I got that this violent event that took place over months wasn’t settled in the collective unconscious. To my knowledge, neither Pakistan nor India had agreed on the final death count. Nor did they create a memorial to these hundreds of thousands, perhaps millions, dead. This allows the memory to simmer just below the surface of the Pakistani and Indian identity, and we still see it bubble to the surface when tensions rise. The violence was animalistic in 1947. Men turned to savages. Neighbors killed neighbors. Women were mutilated and tortured. Children were torn to pieces. I feel it’s important to settle this past, to acknowledge it, in order for the last of that generation to have peace so that the younger generations don’t carry this burden or violent memory. My grandfather lost most of his family during the Partition. I also visited Riga, Latvia, and did a great deal of research about World War II, which is a strangely ever-expanding topic. Because of the scale, people can never feel as if they know everything about the subject. My family has a complicated story on this side. In the novel, Oma is a fairly real character, though the book is fiction. My grandmother’s escape from the Nazis and Russians with her two children, my aunt and uncle, was always something that haunted me. Her strength and cleverness, which saved them all as they went from Latvia to Poland, from DP camp to potential new homes, is inspiring. Q: What surprised you the most during the writing and research? A: My research into butterflies was so enjoyable. I would spend days watching little blues mud-puddle in the spring here in Boulder’s Chataqua Park or one of the many other trails. Once I began to look for them, I began to see them everywhere. It’s like a switch turned on in my perspective. Butterflies are the second most important pollinator to bees, and that altered the way in which I see them. To me, they are beautiful, yes, but they are so much more. There are many groups and associations that focus on counting, following, and discussing butterflies and other invertebrates, like Xerces Society and the North American Butterfly Association. Q: How has your own multiethnic background informed the story? A: It informs everything I do. My brother and I speak frankly about how we were raised with this sort of unspoken pressure to achieve. Though it was never said aloud, we knew how hard our parents fought to come to America and about all the conflict our ancestors encountered. This fueled us to work hard, study hard, and do well. Many first-generation kids have this same fire. It’s also uncanny to sit between two or three cultures, but all in all, I feel it’s a good kind of strange, one that deepens the questions you have about society and places. I feel more comfortable in the in-between. Q: Which character is closest to your heart? A: I feel for each and every one of these characters. I feel that Paul is trying so hard to be honorable in a shameful world. Maija is caught in the cruel balancing act of motherhood, work, and ghosts. Isabella is a remarkable young woman who is coming into her own as well as she can. However, it may be obvious that I sympathize with Vic the most because he tends to be the most central character with his blog and the most chapters. I feel for him because he is so outside of what is considered normal; he looks different and sees differently. I’ve never really felt I fit in to what was considered normal—perhaps no one really does, and that is the truest fallacy. It brought me great joy to follow his coming of age. What a great way to know the author a little better. So many things to learn, so little time. Sparked my interest to read the book. Thank you for reading! I too enjoy hearing an author’s stories behind a novel, and Olivia has so many interesting insights. 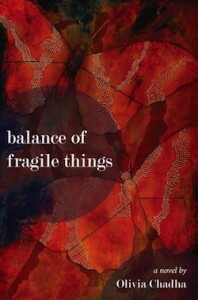 I hope you enjoy BALANCE OF FRAGILE THINGS!